A budget is a municipality’s operating guidebook, allocating how resources are used to provide services throughout the year. 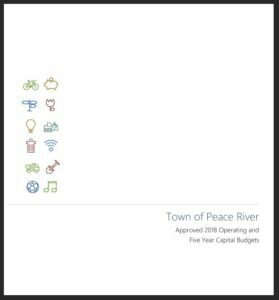 Peace River’s 2018 Operating and Capital budget was passed during Town Council’s regular meeting on Monday, March 26, 2018. Revenue needs increased from 2017 by $302,750 or 2.8%. As a result, ratepayers should expect to see, on average, tax bill increases of around 2.4%. At that amount, a home valued at $300,000 would pay approximately $5.20 more per month in property taxes. This does not factor in new construction, improvements made to properties or market-value changes property sales etc. Tap or click to view the 2018 Budget Book. funds totalling $25,000 for new recreation billing software, to be ready for the opening of the Peace Regional Recreation Centre. Infrastructure, specifically the maintenance and upgrades were a high priority for the Capital Budget. 26 Projects will go ahead this year. $2,966,700 in water and sewer projects including lift station replacements, sewer treatment plant upgrades and starting the replacement of Reservoir 365. During budget deliberations, four meetings were held in 2018 to allow residents the opportunity to bring the budgetary concerns directly to Council. Additionally an online form was made available to allow residents to write in, all feedback received was taken to Council for consideration.